​Naltrexone has been used for quite some time in a variety of formulations in recovering addicts and has been proven to be quite effective especially in heavy drinkers: helps to substantially decrease the use of and hopefully eliminate the intake of alcohol. The Naltrexone implant falls under the opioid antagonist family. Drugs like oxycontin and heroin contain opioids and as a norm for these drugs usually interact with the human body through opioid receptors. Naltrexone being an opioid antagonist usually works by blocking these opioid receptors and in doing so prevents the body from being affected by opioids from drugs. Naltrexone has the advantage of being time-tested and non-addictive in nature and as such, eliminates the craving for drugs giving an individual the opportunity to focus on the recover process. The Naltrexone implant is usually in form of a small non-narcotic pellet which as a norm is usually inserted under the skin near the lower abdomen: the medicine gets released into the body slowly over time. As a norm, local anesthesia is administered before the procedure is performed . The procedure usually takes a very short time and a patient is released soon after. What benefits does Naltrexone Implant have over oral tablets? When compared to oral tablets, Naltrexone implants are considered as being one of the best. For starters, Naltrexone implants have a significantly higher success rate when compared to oral tablets. The reason behind this is that, the Naltrexone implant is placed within an individual’s body and gets released into the body over time. As a result, an individual cannot skip, deliberate avoid or forget to take the medication: the primary reason tablets have low success rates with recovery. Sobriety with oral Naltrexone has demonstrated only a 10% success rate. When on Naltrexone use; some individuals might resort to take an extremely high dose of drugs so as to get a high. Even though the Naltrexone prevents the body from absorbing these drugs, an extremely high dose of drugs can be potentially lethal. 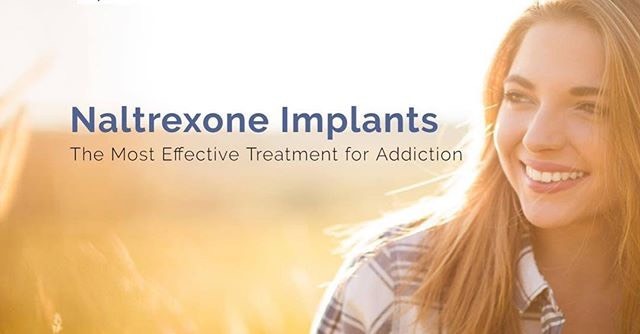 When the Naltrexone implant therapy ends, an individual’s body has been basically reset to its initial state and as a result, what was presumed to be a normal dose of the drug prior to the therapy can be a fatal dose if taken after this therapy. How long is the Naltrexone therapy? The Naltrexone implants/therapy can take anywhere from 6 to 12 months. However, it’s important to note that every patient is unique and as a norm, the rate of absorption of the drug varies on a case to case basis with some individuals absorbing the drugs faster than others.